"The Oakville Art Society will move to new headquarters in Coronation Park. The new premises will be a permanent home for the Art society which will be in the midst of natural scenery. Classes will be held throughout the winter and will be used as a gallery during the summer. It will also involve the crafts such as weaving, etc. 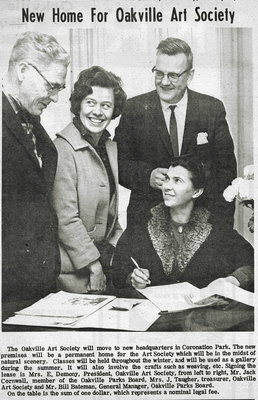 Signing the lease is Mrs. E. Demeny, President, Oakville Art Society from left to right, Mr. Jack Cornwall, member of the Oakville Parks Board, Mrs. J. Taugher, treasurer, Oakville Art Society, and Mr. Bill Bateman, General Manager, Oakville Parks Board. On the table is the sum of one dollar, which represents a nominal legal fee." 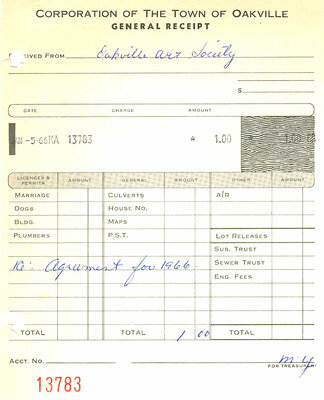 The original receipt showing a rental fee of $1.00 for the year of 1966. 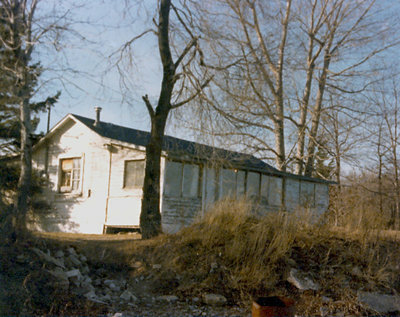 In the early days of the OAS, the society leased a small white cottage located in Coronation Park, originally owned by Judge H.C. Arell. In 1965, the executive team signed a five year renewable lease for $1.00 a year. Affectionately named the Cottage, the building needed renovations before workshops could be held. Funds were raised and many family and friends lent their expertise and time to help the Cottage become the home of the Oakville Art Society. The land the Cottage sat on was purchased in 1884 by John Wilson, who ran a successful fruit and dairy farm. Several cottages existed on the land as well as a two-story red brick farmhouse. The red farmhouse would also come to be part of OAS in later years. The Cottage that would become the future home of OAS was built by George Leslie in 1923. Mr. Leslie was a descendent of John Andrew, one of Oakville’s earliest settlers. 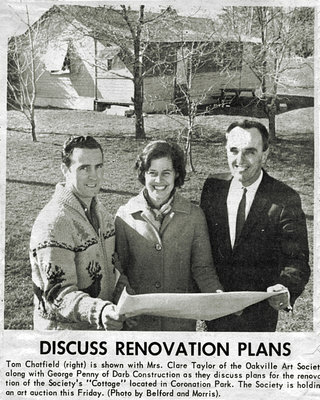 The Wilson family still owned the land until it was sold to the Town of Oakville in 1963 by Mrs. Jill Wilson. 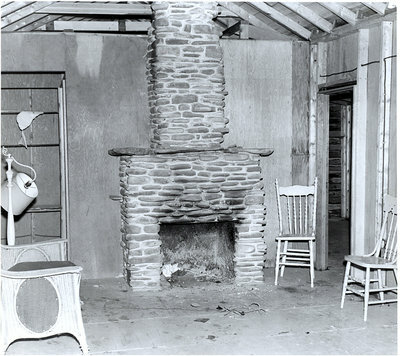 Restoration and renovations to the Cottage began in the first part of 1966, and were completed by the fall of the same year. Workshops and classes began in the Cottage the following fall in 1967. 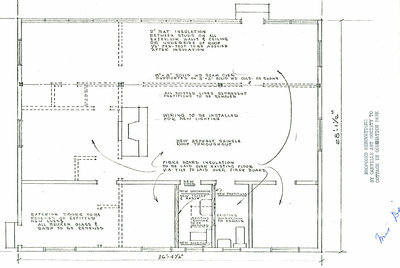 Proposed renovations to be done to the Cottage before classes and workshops could be held.